Expired 6mo ago . Last validated 6mo ago . Used 12 times. Dennis Fowler Offer valid only through 11:59 p.m. (PT) on October 1, 2018. Receive 20% off $100+ order, 25% off $125+ order, or 30% off $150+ order at http://www.cubavera.com. 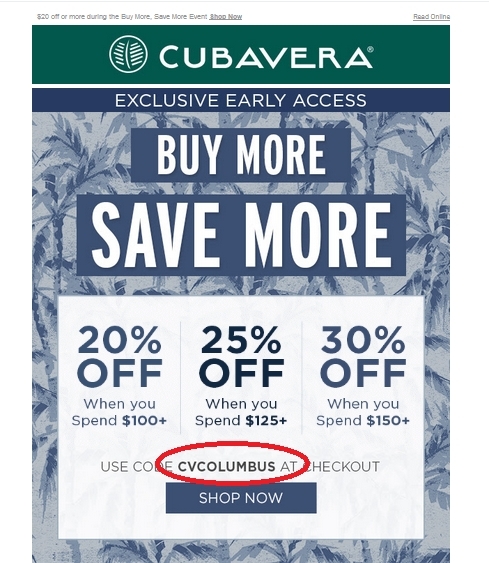 Please enter promo code CVCOLUMBUS at checkout.